Please note if you have registered online there is no need to stop at the registration tent. The registration tent is for walk-up Walkers and for turning in money. Walk T-shirts will be available at the incentives tent. Walkers who paid the registration fee or raised $100 or more are eligible for a shirt. Republic Square Park is located at 4th and Guadalupe Sts. We encourage carpooling, biking and public transit. If you choose to drive, there is parking available around Republic Square Park. There is no charge at the street meters on Sunday. Lyft has partnered with the AIDS Walk to offer a special discount ride to Walkers. First-time Lyft users can receive a $20 ride credit. Simply download the Lyft app on your phone, enter the promo code AIDSWALKAUSTIN in the Payment section, and request a ride! Why worry about parking downtown when you can Lyft? Proceeds from the promo code will benefit AIDS Walk Austin. AIDS Walk Austin begins and ends at Republic Square Park at 4th and Guadalupe Sts. Stay tuned for more details on the route itself. For public transit directions, use Google's Capital Metro trip planner directions or call the GO Line at 512-474-1200. 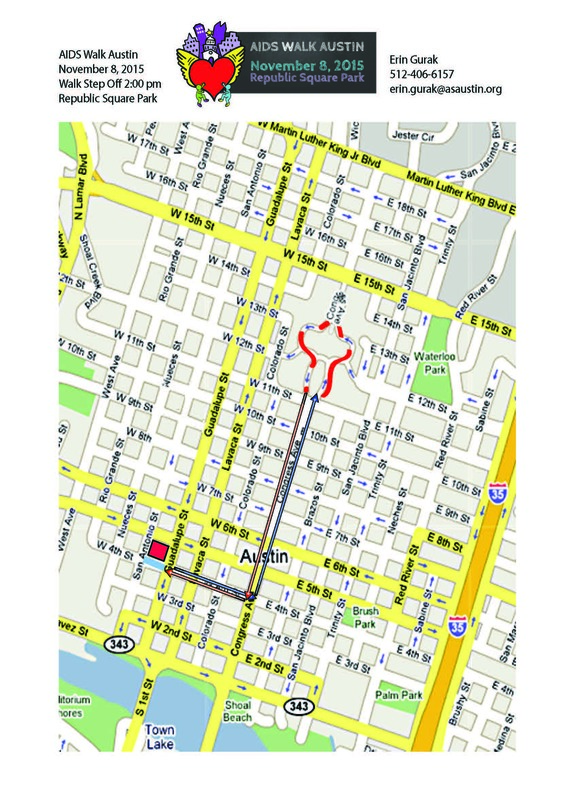 AIDS Walk Austin is a 2-mile route and takes under an hour to complete. See the map to the right to view the route. Come early, be loud and stay late with your appetite! Food trucks will be located along 4th Street behind the entertainment stage with a variety of food offerings. We welcome your canine pal as long as he or she is kept on leash and is friendly to other dogs and children. Dog owners should bring enough supplies to clean up after their pets, especially along the walk route and in grassy areas where children play. Water will be provided for our four-legged friends. You can continue to receive online donations on your personal fundraising Web page until November 30, 2015. You can also mail checks, money orders, and matching gift forms to the AIDS Walk office all year round. You can also turn in your money at the Registration tent on the day of the walk starting at 12:30 pm. * Please be sure to clearly indicate the name of the walker or team who should receive credit for the donations you collect. The money you help raise goes to AIDS Services of Austin and the fundraising teams of Austin's other outstanding AIDS service and education providers! Of every dollar donated to ASA, 87% goes directly to services, a mark of good stewardship. Your contribution will make a difference in someone’s life right here in Austin.